The Lower Yuba River flows from the dam at Englebright Lake to its confluence with the Feather River, just south of Marysville. It begins the journey in a rocky basin paralleled by steep canyon walls, a deep gorge otherwise known as the Narrows. 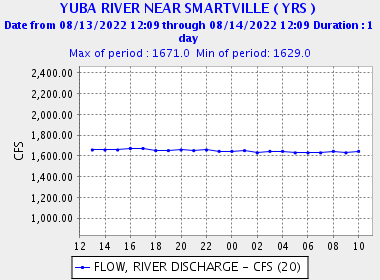 The Yuba continues, winding its way west, down through canyons and over gravel beds until the landscape begins to flatten out just above the Parks Bar Bridge (Highway 20). From here, the river parallels the highway for the next 20 miles or so as it makes its way to the Feather. About seven miles below the bridge stands the Daguerre Point Dam. Built in the early 1900’s to prevent hydraulic mining debris from washing into the Feather River, it now acts as an obstacle to boats and anadromous fish alike. With its healthy wild Rainbow population, and steelhead in the fall, it’s no wonder the Yuba is a favorite with many fly anglers. In addition, the river below Daguerre Point Dam supports other anadromous species including American Shad and Striped Bass.